Mike Gibb worked as an insurance loss adjuster before retiring and writing Scottish musicals full time. Since 1995 Mike has been writing Scottish musicals and plays. His first play, A Land Fit For Heroes, was shown at The Lemon Tree, Aberdeen in 2001. Other productions soon followed at more venues, including The Aberdeen Arts Centre. In December 2009 Mike Gibb published the book Ask Anna: An A to Z Guide for Dogs which is avalable from Amazon (current price and details to the left and below) or locally at Waterstones, Yeadons booksellers of Elgin and Banchory and the charity Dawgs. Ask Anna: An A to Z Guide for Dogs is written as if by a Golden Labrador to help dogs understand humans. Mike has generously donated the proceed of the Ask Anna books to local Aberdeen animal charity DAWGS. On the 20th anniversary date of the Piper Alpha disaster Lest We Forget will be performed at the Lemon Tree in Aberdeen. 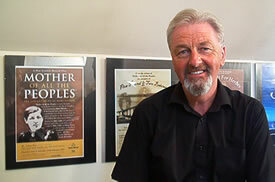 Mike Gibb was commissioned by the Aberdeen Performing Arts (APA) to write an Aberdeen themed play. Lest We Forget was to be performed at the rehearsal studio at His Majesty's Theatre and the venue was changed to the newly reopened Lemon Tree studio theatre. Lest We Forget performances run from Wednesday 2 July to Sunday 6 July. This last performance will be the actual anniversary date of the Piper Alpha disaster. A Land Fit For Heroes follows the life of a 1920s Highland family with their eviction from their croft and their subsequent adjustment to Glasgow City life. Children Of The Sea is a play based on the late 19th Century fishing disaster in Eyemouth which saw the loss of over 180 lives. Five Pounds And Twa Bairns is a play based on the 1878 Edinburgh to Dundee train disaster and the effects on three families who lost a loved one. Herriot is the true story of vet Alf Wight who penned veterinary novels under the pseudonym James Herriot which later became the television series All Creatures Great And Small. Mother Of All The Peoples tells the true story of Aberdeen born and Dundee raised missionary Mary Slessor and her work in Calabar. The Centenary date of when she left Scotland for Malawi was celebrated on 7 March 2007 with a production of Mike Gibb's play at the Scottish Parliament in Edinburgh. This was organised by North East SNP MSP Maureen Watt. What Goes Around is a comical and at times sad play about a lady who is placed into a retirement home by her family. Sunday Mornings On Dundee Law is about four young people who meet in a Dundee ballroom near the end of World War II. Clarinda is a musical play based on the life of Nancy McLehose and her love affair with Robert Burns. Clarinda opens on Burns night in Edinburgh and then tours Scotland. The Aberdeen showing of Clarinda takes place at the Aberdeen Arts Centre on the 15 and 16 February 2008. Mike edited Masquerade magazine and was the UK correspondent for Show Music magazine. He reviews CDs for Spotlight on Musicals magazine. Contact Mike at his website Hame Page, but just don't mention Brigadoon! See www.hamepages.com for more information about Mike, his plays and musicals and to buy CDs and books.